Design a unique look for your home with our beautiful selection of Roller blind accessories. Get creative with decorative pulls and braids, stylish eyelets, poles and choice of shaped hems. Our decorative pulls come in a wide range of styles and finishes, from sleek metallics and natural wood tones, to brightly coloured fabrics and tactile tassels. A pull is essential for our luxury spring operated blinds, but can also be added as a decorative finishing touch to sidewinder blinds when you choose a straight, wave or baroque style hem. For a distinctive look, finish your Roller blind with one of our gorgeous fabric braids. 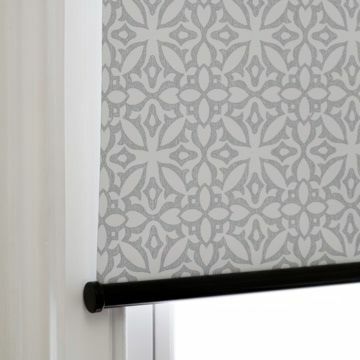 Enhance a neutral blind with an accent shade to match your décor, or create interest with one of our stylish patterned designs. To give your Roller blind an extra special look, choose an arched or turret style hem and pick out one of our beautiful pole and finial combinations to finish your blind to perfection. We have a stylish selection of wooden and metal poles to choose from, as well as decorative bottom bars for Roller blinds with a straight hem. A shaped hem can transform the mood in a room, softening the overall look and creating a sense of elegance and luxury. For a relaxed look choose a soft wave hem, and for a sophisticated finish pick a classic baroque style. Our turret and arched hem styles, combined with a decorative pole and finial, are perfect for contemporary spaces. If you have skylight windows that are hard to reach, or multiple blinds on doors and windows, then our motorised controls are a must. With a touch of a button, you can operate your blinds quickly and easily, all from a single remote control.